VFS - FAA Policy on Part 27 "Safety Continuum"
FAA Policy on Part 27 "Safety Continuum"
Home » FAA Policy on Part 27 "Safety Continuum"
In a post dated June 30, 2017, the FAA published Policy Statement PS-ASW-27-15, “Safety Continuum for Part 27 Normal Category Rotorcraft Systems and Equipment.” Although this was expected to directly address the industry White Paper for Instrument Flight Rules (IFR) certification for single-engine (Part 27) helicopters, the FAA has clarified that the Policy does facilitate the use of modern technologies for improved safety. Read the FAA artice, "Safety Continuum on Track," from the March/April 2018 issue of the Vertical Flight Society's Vertiflite magazine. There is broad consensus throughout the rotorcraft industry and operational community that equipage and training for IFR operations in single engine helicopters has the potential to make a significant impact on safety, as outlined in the 31-page industry white paper. The Vertical Flight Society and our partner associations believe that the unacceptable number of lives lost due to inadvertent IMC or CFIT accidents in single-engine helicopters that result from low-level flight to avoid weather can be easily addressed if the FAA faciliates IFR certification of single-engine helicopters through the new Safety Continuum policy. In addition, the expanded use of IFR operations has the potential to improve the safety for Part 29 by encouraging the more ubiquitous use of IFR. In a March 2014 discussion, FAA leadership requested that industry provide a consensus recommendation on long-running industry dissatisfaction with the existing FAA position that on IFR that was a major barrier for single-engine rotorcraft to take advantage of modern technology to save lives. On July 12, 2015 (after more than a year of effort), a coalition of helicopter manufacturers, operators and associations — namely the General Aircraft Manufacturers Association, VFS (then known as AHS International), Aircraft Electronics Association, and the Helicopter Association International — made public a White Paper which detailed the safety case for easing the process for Instrument Flight Rules (IFR) certification for single engine rotorcraft. Key to the White Paper was the recognition of the dramatic technological leaps that have been made over the past 15 years that was not accounted for in the Advisory Circular currently governing the certification process (AC27). The White Paper outlined a generic means of compliance with 14 CFR 27 that will provide an avenue for rotorcraft-use of proven and appropriately adapted airplane safety technology. 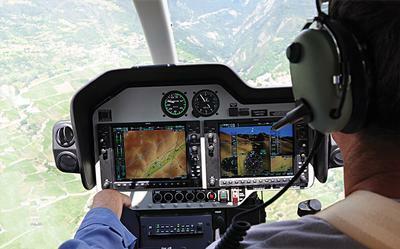 WAAS-GPS — the Wide Area Augmentation System is an air navigation aid developed by the FAA to augment the Global Positioning System — has paved the way for point-in-space helicopter-specific instrument approach procedures and low-level IFR routing. Newly certified advanced digital autopilots and stability systems along with modern glass cockpits have dramatically reduced pilot workload and increased situational awareness. Combined with inherit digital system redundancy and integrity monitoring, these advances represent a potential paradigm-shift in the future of vertical flight operations. The coalition asserts that leveraging these developments to improve the IFR certification process will help enable the production of training and entry level IFR rotorcraft. This is seen as a primary and fundamental first step towards changing the helicopter culture to one where trained and proficient pilots choose the safety of IFR operations over Visual Flight Rules (VFR) operations in less-than-VFR weather conditions. In a letter from the FAA dated July 25, 2016, the agency responded to the joint HAI-VFS-GAMA-AEA white paper that had been submitted in Nov. 2015. The white paper was a proposal for "an alternate acceptable means of compliance with Part 27 as it pertains to the IFR certification of single engine rotorcraft." In its response, the FAA noted that it had "has begun the process of adopting some of the concepts and recommendations of the whitepaper into a proposed Safety Continuum for Part 27 Systems and Equipment Policy Statement." The letter noted that this safety continuum "will establish classes of Part 27 rotorcraft based on aircraft weight and passenger capacity for rotorcraft up to 7,000 pounds." Most promising was the regulatory agency's outlook that the continuum would "facilitate a more rapid incorporation of advances in technology for systems and equipment by recognizing a balanced approach between the risk and safety benefits for installing such technology." The joint industry association team applauded the FAA's progress in its press release: Industry Welcomes FAA Response to Call for Alternate Means of Rotorcraft Compliance, Aug. 24, 2016. VFS hoped that the final Policy Statement would incorporate all of the critical recommendations of the white paper to reduce accidents. VFS experts reviewed the document and provided detailed recommendations and feedback in a letter on March 16. Although this proposed “Safety Continuum” policy had been previously tied to the industry/association white paper on SingleΓÇÉEngine IFR Certification described below, there is essentially no relief in the proposed policy that would that permit the cost-effective equipage and training for IFR operations in single engine helicopters, and thus is projected to have an insignificant impact on avoiding accidents due to flights into an inadvertent Instrument Meteorological Condition (IMC). This VFS letter was developed after careful study of the proposed policy. The FAA also posted the 50 public comments by 10 associations, individuals, companies and agencies, most of which objected to the incompleteness of the (then proposed) policy. The Vertical Flight Society and the helicopter industry were disappointed by limitations of Policy Statement PS-ASW-27-15. VFS provided a letter on Aug. 9, 2017 expressing the hope that the FAA will re-engage with industry to work towards the widespread adoption of IFR operations by all rotorcraft and reduce the needless loss of life by trying to fly in bad weather without IFR equipment and training. As a result of this letter, a dialogue was initiated between the FAA Rotorcraft Branch and the four associations — and then with the broader industry — that clarified the intent and desire of the FAA to support single-engine IFR operations. This perspective was briefed on a webmeeting on Nov. 27, 2017 and subsequently in other forums.